I’d like to wish everyone a happy christmas full of presents and love! I hope you all had a nice holiday. Gostaria de desejar a todos um feliz natal cheio de presentes e amor! Espero que todos tenham tido um bom feriado. 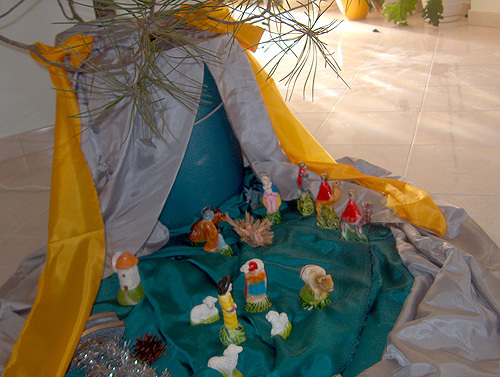 I’ll leave you with my nativity scene made of fabric since I didn’t get a nice photo of my christmas tree. Deixarei-vos com o meu presépio feito com tecido pois não consegui uma foto decente da minha árvore de natal. And here’s my sweater, what it looked like today. E aqui está a minha camisola e como estava hoje. Cath and Ikea. Cath e Ikea. I had one full of sickness!! I visited your blog today, I love your Nativity! Did you make it? I didn’t get into the holiday magic this year, outside of watching the many Christmas movies on tv (not the animated ones, but lovely sentimental stories, all with happy endings) I never even put up our tree since we just got the cat who gets into everything. I copied your brownie cookie recipe, hope to try it. I’ve eaten brownie-like cookies but have never found a recipe. Actually, the one I think I had was actually on the brownie mix, so it was very “brownie” tasting! I’m so spoiled! I didn’t realize that you were so young, 17 is my favorite number. I envy you your computer experience – it is so mysterious to me, there is so much I don’t know how to do. The whole computer stuff came into existence after my high school years. It’s like growing up before the telephone was invented! Thank you for sharing your blog & posting in both Portuguese and English. Seeing the same passages helps me to see how the words work into proper sentence structure. I hope to keep learning my ancestral language, though now have less people to speak it with. Bem obrigada pela parte que me toca pois tb gostei das fotos e as caixas são um espectáculo lindas mesmo tb queroooooooo,adorei .Ainda bem que gostas-te dos presentes foram todos feitos com muito carinho .